As you consider which home improvements to tackle in the coming year, two primary questions may come to mind: How much will the remodel project cost? And, what sort of value will it add? Choosing which renovations are best for your home in 2019 can depend on numerous factors, including the age and estimated value of your house, how it is used (as a primary, secondary or rental home), and simply what spaces are unattractive or cause frequent frustration. Different homes may benefit from unique or very specific projects, but in general, kitchens and bathrooms continue to be spaces singled out by realtors and other industry professionals as being valuable renovation areas. 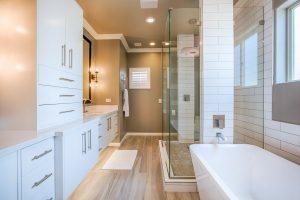 Why choose a bathroom remodel? Remodeling a bathroom in your house may cause initial hesitation. After all, the cost and time investment are substantial. The benefits, however, are also plentiful. From adding storage to improving the room’s efficiency or appearance, the bathroom remodel return on investment makes the project worthwhile. You can improve the quality of life for yourself and other household members, make guests more comfortable, and appeal to future homebuyers who will care about water pressure, lighting, storage, layout, and other elements in the bathroom. You also can improve the energy efficiency of your home by updating certain features, including showerheads, faucets, and lighting, which will generate savings on energy costs after the project is completed. While remodeling, many families also choose modern solutions to create extra storage space, which can be used for items that would otherwise clutter countertops or other areas in the home. Bathroom remodels require specific materials and the market price of those materials can fluctuate, impacting the bottom line for your project. Different contractors will also charge different rates. If you want to remodel your Delaware bathroom without going over budget, it’s important to find out from your general contractor their average bathroom remodel cost, depending on the size of the space and which services are included. On average, it costs about $20,000 for a basic-level remodel, which includes replacing the existing tub and shower base, installing a porcelain tile floor and shower walls, adding custom shower doors, updating electrics, and renovating plumbing fixtures and cabinetry. You’re also paying for space planning and layout design and the benefit of having a project manager, in addition to labor and materials. For a second-tier, or mid-level, renovation, you’re looking at about $30,000. A remodel of this nature would expand the existing shower base and also provide limited fixture movement, in addition to the features of a basic-level remodel. You also can incorporate granite or quartz into your countertop or shower. An upper-level remodel—priced about $45,000—includes installing a new tub and/or expanding a shower with a seat. Appliances and fixtures may be moved to other locations within the bathroom and you will get electrical changes or updates. Other aspects of the remodel can include installing a natural stone floor, shower base, and walls. While these are general costs for different remodels based on materials and services, the price may also be scaled to the size of the bathroom. For example, the average cost of master bathroom remodel is going to be more than the cost to remodel a typical hall bathroom or half bathroom. Many projects also fall between the mid- and upper-level categories. Within the industry, there is debate about bathroom remodel ROI and how quickly costs poured into updating the room will be recouped. 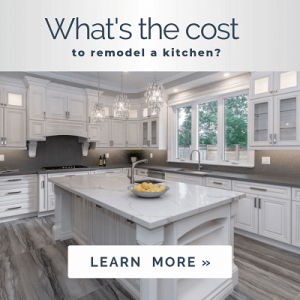 In general, though, mid-range and upscale bathroom remodels recouped about 55 to 70 percent of their value in the New England area in 2018, according to Remodeling, a site that compares average costs for remodeling projects. This was an increase from the fiscal value in 2017. Bathroom remodels add value in another way, though. Like bedrooms, you spend ample time each day in the bathroom, handling your morning and evening routines, including showering, shaving, and getting ready for the day. It’s important that your bathroom be a place that feels comfortable and inviting, and is functional for your needs. Whether you have pinpointed specific items to be addressed with a bathroom remodel or want new ideas for how to improve the aesthetic and function of the space, don’t hesitate to contact Bromwell Construction Company, headquartered in Wilmington, Delaware. With many years of experience in the construction industry, they possess valuable insight on home improvements and how a bathroom remodel can benefit you.